On the Lower East Side, the Cranmore movie theater is having a midnight showing of Bruce Lee’s “Enter the Dragon”. Gathering there are two rival martial arts schools: the Crane and the Dragon. The leaders of each school meet and intend to use this gathering as an opportunity to heal old wounds and end the rivalry between them. 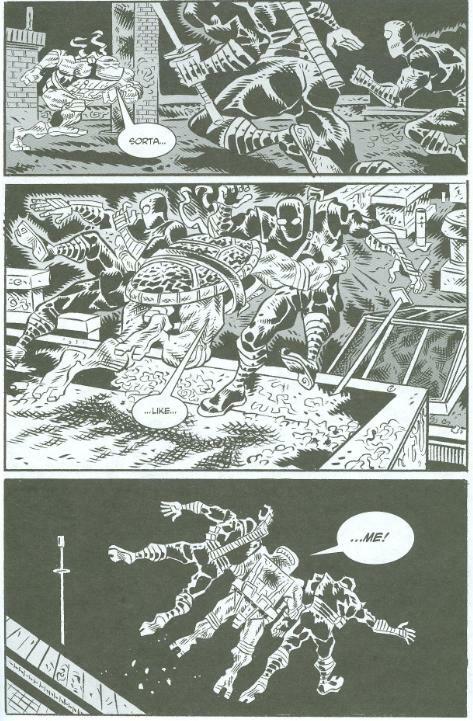 On the rooftops not far away, the TMNT are engaged in a running battle with the Foot clan. Don compliments them on their form and grace, though their threat is more in their formidable numbers, as they swarm the Turtles from every direction. The Turtles fight their way to the roof of the Cranmore, where Raph drags two Foot Soldiers through the skylight and into the theater below. The other Turtles and more Foot Soldiers shortly follow. The Crane and Dragon students are shocked and, at first, simply stand back and observe the fight (though Raph would much rather observe the movie on the screen). An argument then erupts between the Crane and Dragon students as to which style is better: Turtle or Ninja? The students then start beating each other up, much to the confusion of the Turtles. The cops eventually arrive and the Turtles and the Foot Soldiers vanish. As the cops break up the madness and usher the martial artists out of the theater, some leave with a desire to track down the mysterious ninja and train with them, while others wish to pursue the ways of the Turtle. Others simply continue their argument of which style is better: Crane or Dragon? On a rooftop overlooking the theater, Michelangelo has the answer: “Turtle style is best”. *For what it’s worth, I read this story as taking place between the death of the worm-Shredder in TMNT (Vol. 1) #21 and the subsequent Foot Civil War beginning in TMNT (Vol. 1) #50, when the Foot were shown to be inept, uncoordinated and laughably easy to defeat. 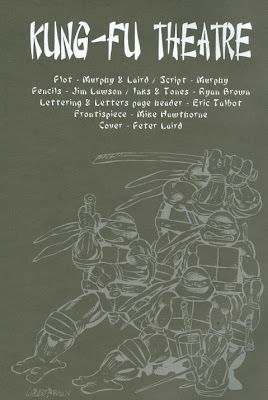 The story fits in well with others of the same tone, such as “Digital Webbing Presents TMNT” and “Challenges: Raphael”. Clocking-in at 20 pages, “Kung-Fu Theater” is almost long enough to be a full-length issue in itself, though it was pretty great that it came packaged as the lead alongside two other shorts and ten very cool bonus pin-ups (Stan Sakai’s, Michael Dooney’s and Dario Brizuela’s were my favorites, with Eric Talbot’s and Dan Berger’s as close runners-up). Though 20 pages-long, I can see how “Kung-Fu Theater” would be better suited as one installment in an anthology issue, as it is exceedingly light on content, focusing more on the fights than the story. But where the fighting is concerned, this is actually some of Lawson’s better contemporary work; the two-page splash covering pages 6 and 7 is really cool. 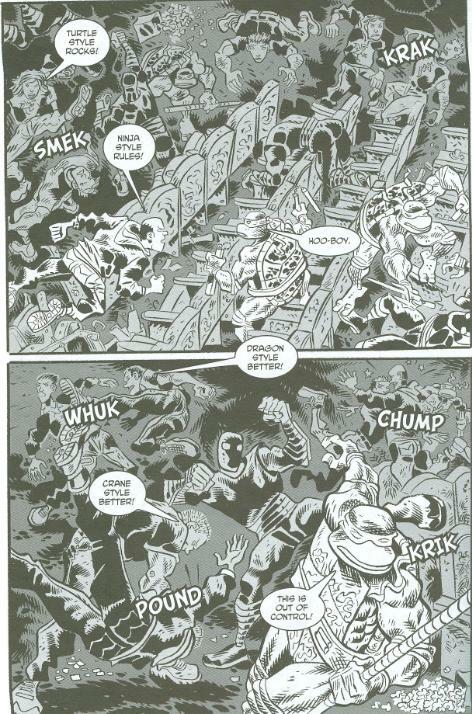 I especially love how all the Foot Soldiers are in various states of scramble, attack, defense and unconsciousness. Story-wise, it’s more of a gag strip that, if the fight sequences had been more compressed, probably would have allotted a typical 8-page back-up. Still, the bickering between the Crane and Dragon students giving way to a Ninja vs. Turtle style debate, then giving way to a second brawl spiraling into the Turtles’ brawl with the Foot made for some amusing chaos. But, I've got to know, who puts a skylight in a movie theater? I found that to be funniest of all. Really, I’m a sucker for any issue where the Turtles take on the Foot clan, so even if this isn’t the deepest story it’s still a whole lot of fun. 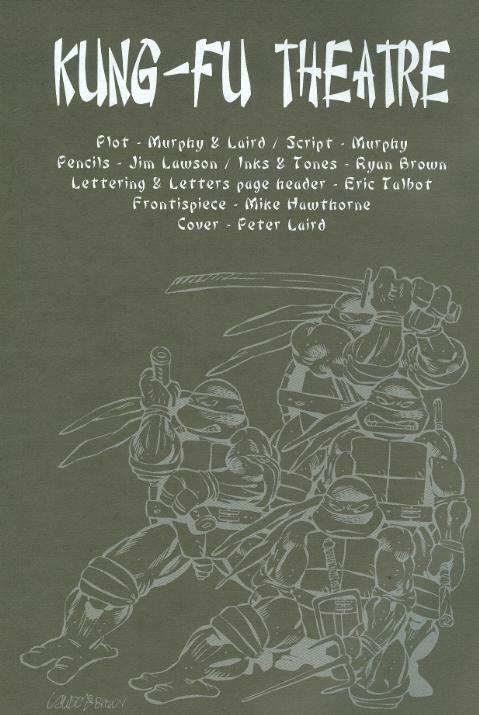 Like I said in the notes, it works well during that span of time between “Return to New York” and “City at War” where the Turtles were shown fighting a sloppy and disorganized Foot clan, though the Foot seemed in slightly better shape here than in other encounters from that period.